Roman Bellic's Broker-based Express Car Service in GTA IV. Express Car Service, also known as Bellic Enterprises, is a taxi service featured in Grand Theft Auto IV. 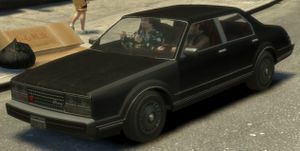 Owned and run by Roman Bellic, Roman's taxi service was initially the only legitimate source of income for Roman prior to Niko Bellic's arrival in the beginning of GTA IV's storyline. The venture's existence was supposedly the result of of Roman's hard work; during "Roman's Sorrow", Roman claimed that he had to acquire one taxicab at a time before he was able to secure a proper depot in Hove Beach, Broker, for his operations; until he managed to obtain an actual place of residence, Roman also spent over a year residing in the depot, sleeping under the depot's office desk. During the Broker arc of GTA IV's storyline, Roman is seen to be actively running the service, although his operation is beset by threats from Albanian loan sharks. Roman's service has also been used to ferry small-time criminals regularly, as is the case with Jermaine Andrews ("Easy Fare") and Little Jacob ("Jamaican Heat"); this may had been the initial reason Michelle requested Roman drive her and Mallorie Bardas in "Three's a Crowd". After "Russian Revolution" reveals that the Russian Mafia, then led by Dimitri Rascalov, has learned of Niko's relation with Ray Bulgarin and turned against the Bellic cousins, Roman's Broker depot, along with his Broker home, is burnt down by the Russian Mafia under orders of Rascalov. This forces the cousins to flee East Island, seeking refuge in Bohan. Although a witness account of the fire in a Weazel News report claimed that it was intentionally started using Molotov cocktails, it is later revealed in a phone call from Roman following "Blow Your Cover" that the insurance company wrongfully believed that it was an electrical fire, not arson, that gutted the depot, allowing Roman to receive a financial settlement. The money is then used by Roman to finance the creation of a new depot, with the location being unknown to the player. It is unknown what happens to the depot after Roman's death in the "Deal" ending of GTA IV. However, it is presumed that Roman's business continued after the "Revenge" ending, as he is still alive and has no need to stop. Several additional gameplay-related features are tied to Roman's taxi service. Having aided Roman as a non-employee, Roman eventually offers work to the player to carry passengers for his business following the end of "Jamaican Heat". Unlike previous GTA taxi driver missions, however, these do not contribute to 100% completion, nor do they pay very much (how much Roman gets depends on time take the deliver a passenger, damage, etc.). The missions serve only to help familiarize the player with driving and the layout of East Island, while generating small amounts of cash for early purchases. After a certain number of fares, however, Roman withdraws the option, claiming his employees are starting to complain. These jobs are made permanently unavailable after the destruction of the garage "Roman's Sorrow"; although Roman subsequently opens a new garage, Niko is never told where it is, and therefore there is no physical location from which to obtain a cab for further fares. Niko is able to utilize Roman's taxi service to travel around the city for free between "Bleed Out" and "Roman's Sorrow", once Niko attains (and maintains) a friendship level of 60% or more with Roman; Mohammed is always the designated chauffeur for the player, and the "fare" for the ride is that Niko must put up with Mohammed's complaints about driving him around. During the ride, the player can choose to watch the scenery go by (a good way to observe the game's AI NPCs in action, and to spot locations of interest), or skip the ride. Using the taxi service is one way of avoiding having to pay tolls. After Roman's garage is destroyed in "Roman's Sorrow", Niko temporarily loses access to the car service, until shortly after "Blow Your Cover" when he receives a text from Roman saying the service is available again. If Roman is killed following the "Deal" ending, the player loses access to the taxi service. Roman's Taxi in GTA IV. Roman's taxi service utilized two different vehicles over the course of the storyline. Prior to "Roman's Sorrow", the service employed the use of multiple Roman's Taxi sedans, a specialized variant of the Esperanto. After Roman taxi service is restarted after "Blow Your Cover", however, the service upgrades to using a fleet of black Cavalcade SUVs. A black Esperanto with a random driver will also be seen parked at the Broker depot's garage, although the player will only be able to steal the car rather than ride it like a taxi (note: "stealing" a taxi from Roman's garage is not considered the same as stealing a regular vehicle; the driver does not object - and will in fact voluntarily leave the vehicle - and there is no danger of a wanted level). It is constantly available until the depot is razed. Of the two iterations of Express Car Service referenced, only the first depot in Hove Beach, Broker, is physically present. Accessible from Cisco Street and Iroquois Street, the Broker depot is depicted as a modest and gritty single-storey brick building with a small garage and a built-in office in a corner. Mission markers for most early missions from Roman will be positioned outside the depot, and feature introductory cutscenes that take place within the office of the depot. When the Broker depot is destroyed in an arson attack during "Roman's Sorrow", the player can view the damaged depot on fire (complete with a charred wreck of a car) before or after reaching the burning Broker safehouse. Following completion of the mission, the depot, like the Broker safehouse, will remain in ruin and inaccessible for the remainder of the game. The second depot is never seen nor is its location in the city mentioned. However, given Roman's intention in "Hostile Negotiation" to escape Bohan and head to Algonquin, it can be deduced that the new depot may be based in Algonquin. The Broker depot (along with the Broker safehouse) can still be found undamaged in The Lost and Damned prior to completion of "It's War", when news of events in "Roman's Sorrow" is reported. Because events in The Ballad of Gay Tony begin during "Three Leaf Clover", well after Niko and Roman's escape from Broker to Bohan, both the depot and safehouse are burnt out throughout The Ballad of Gay Tony. 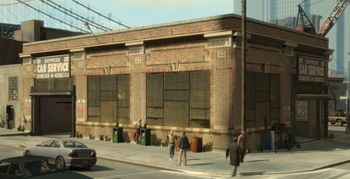 In GTA Chinatown Wars, set a year after GTA IV, the Broker depot is depicted to be in good condition, although it is by no means certain whether the depot was actually repaired and reused as a taxi depot following the conclusion of the storyline. Nevertheless, this could be evidence that the Revenge ending of the game is canon, if this is taken as a sign that Roman still owns the building. The garage of the Broker-based Express Car Service, GTA IV. The Broker Express Car Service's office in GTA IV. The Broker Express Car Service on fire in GTA IV. The ruined Broker Express Car Service following the conclusion of "Roman's Sorrow", GTA IV. The seemingly undamaged Broker Express Car Service in GTA Chinatown Wars. It is possible to enter the Express Car Service depot in The Ballad of Gay Tony (or the Episodes from Liberty City versions of the The Lost and Damned and The Ballad of Gay Tony) using a vehicle cheat code and a clipping glitch, simply spawning a motorbike in a garage door of the Express Car Service depot with a cheat code and getting on the bike. If done correctly, the player should pass through the garage door and find themselves inside the depot. However, there is hardly anything to do in the depot. Unlike other interiors which can only be entered via a glitch, the player does not need to kill themselves in order to leave the depot, only needing to jump through the wooden boards. In The Ballad of Gay Tony in multiplayer mode, it is "half possible" to access the office inside the depot, however, the both doors are covered despite you being able to push them open, one of the doors being covered completely by an un-movable door texture, however the door knob is visible, the other door can be opened by punching it as well and shooting it open, however, the office inside reveals to be completely empty. In Grand Theft Auto V Express Car Service is described as being the worst taxi company in Liberty City by Tavell Clinton. This page was last modified on 6 October 2013, at 22:54.